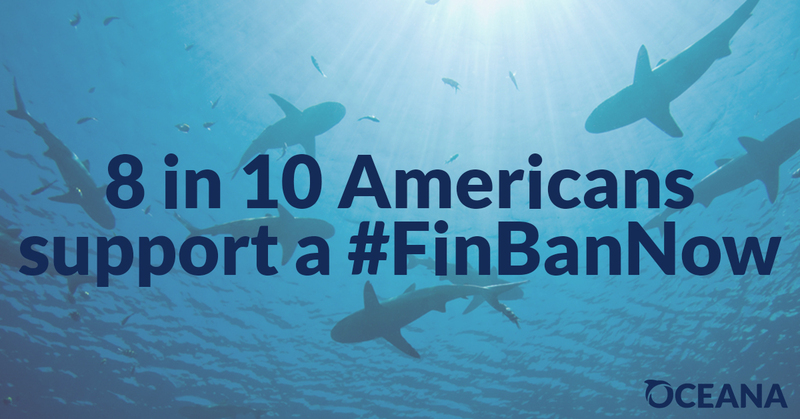 Today, Oceana released a new poll that revealed eight in 10 Americans (81 percent) support the bipartisan Shark Fin Trade Elimination Act, a bill introduced by Sens. Cory Booker (D-NJ) and Shelley Moore Capito (R-WV), and Reps. Gregorio Kilili Camacho Sablan (D-MP) and Ed Royce (R-CA), that would ban the trade of shark fins in the United States. The demand for shark fins is one of the greatest threats facing shark populations around the world. In fact, fins from as many as 73 million sharks end up in the global market every year, putting some species at risk of extinction. While the act of shark finning is illegal in U.S. waters, shark fins continue to be bought and sold throughout the United States. The national poll, conducted by the non-partisan polling company icitizen, surveyed 1,000 registered American voters online from July 12-15, and found broad bipartisan support for the legislation.